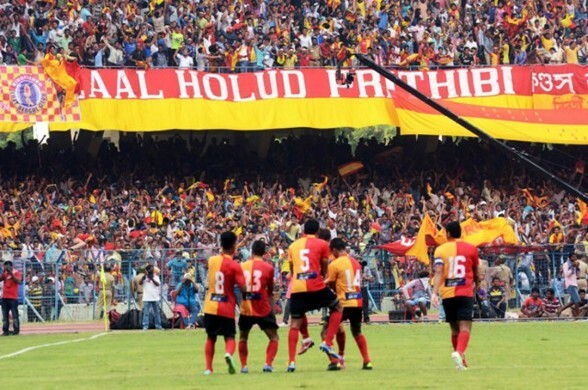 East Bengal huffed and puffed for most of that match. Aizawl had their chances on the break and should probably have had a second. 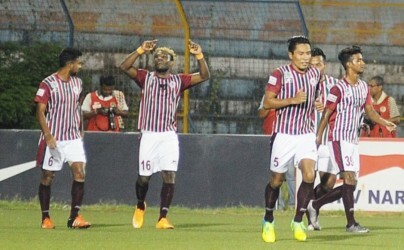 In the event it was the arrival of centre-back Bukenya which provided East Bengal the physical presence upfront. and it he who finally grabbed the eqyualizer with a towering header in the 89 minute to make sure that the season's first game finished all square. You can switch over to Bengaluru where my colleague Srinivasan is standing by to bring you Bengaluru Vs Shillong Lajong. But, for now, its a very good evening from Kolkata. 90+5' There goes the final whistle as both teams share the spoils after an entertaining game. 90+4' Substitution Aizawl Bayi off Lalthakima on. 90+2' Bukenya has another shot cleared off the line and Borges misses by a whisker on the follow up. 90+1' Can either team win this as we go into second half added tim. 89' GOAAAAAAAAAAAAAL East Bengal. Bukenya rises highest off Mehtab's corner and we are level. 86' Substitution Aizawl. Rane stretchered off with what looks like cramp. Mehta on. 83' Ralte with a high boot in the box. The forward goes down. The fans want a penalty. The referee gives a corner.Anwar Ali gets in a header but can't ,make the most of it. 81' Plaza dodges past one defender and produces a good save from Gomes. The corner is easily cleared. 79' Albert's shot deflects of Bukenya and Rehenesh has to tip wide. Corner comes in. Gets cleaared. 76' Jaryan fouled in midfield. Buys his team some more time. 74' Lalruatthara fouls Plaza. Ruidas's free-kick is poor and gets blocked by the ball. The second cross is worse. 72' Plaza fouled b Kingslee. Wedson takes the free-kick and blasts it well over the bar. 69' Jaryan is played in and dummies three defenders before finding the late run of Brandon who can't keep his shot down. 67' Substitution for East Bengal. Gurwinder off Bukenya on. 65' Substitution for Aizawl Lalmuankima off GBrandon on. 63' Substitution East Bengal Poojary off Ruidas on. 59' Rane again picks out Lalmuankima but Bheke comes in with a good tackle. 57' Aizawl corner cleared and as the hosts counter Plaza dances into the box but produces a weak finish into the side-netting. 55' A ball clipped sees Rafique get a header on target but the keeper holds. 54' Bayi once again bullies his way into the box cuts it back for Jaryan who produces a save from Rehenesh. 51' Jarayan and Kamo exchange passes and Anwar Ali prevents a certain goal with a last ditch tackle. 49' Low ball into the box for the hosts cleared by Kingslee. 47' Rane chipps one near post which Rehenesh has to tip over. Two successive corners results and from the second Jaryan rattles the woodwork. 46' Welcome back we are underway in the second half. Plaza has replaced Jackichand for the hosts. Its been a relatively eventless half. East Bengal started the better but Aizawl's organized rearguard frustrated them until Bayi's deflected effort on the stroke of halftime handed the visitors a surprise lead. Much thinking to do for Trevor Morgan. Back in a bit. 45+2 There goes the whistle for the break. We have ourselves a surprise scoreline. 45+1 We go into a minute of added time and we have a GOAAAAAAAAAAAAAL. Bayi's shot from the edge of the edge box deflects of Gurwinder's foot and loops in. 43' Poojary tries an early cross but Gomes comes out and catches. 41' Wedson spot Gomes off his line and tries one from distance. The keeper catchhes it comfortably. 40' EB corner whipped in. Borges and Gurjinder go for the same ball and the former can't direct his header goalwards. 37' East Bengal counrer but the keeper gewts there before Gomes. 35' Bheke's foul on Lalruatthara free-kick Aizawl. Clipped in and inutialy cleared. But Jaryan beats Bheke to the second ball and Bayi almost scores from loopy cross at the back post. But, Rehenesh catches. 32' Rehenesh with the foul on Albert. Lalmuankima lifts in the free-kick. Rehenesh punches clear. 30' Mehtab with a corner but the attempted header deflects and the keeper comes out to catch. 28' Poojary's cross deflects to Wedson who then has his shot blocked. 25' Rafique goes down in the box under the challenge from Kingsley. The referee says nothing doing. 24' Rafique looking a bit ineffective as the loan man upfront. Something for Morgan to think about. 21' Rane to Bayi who is flagged offside. Soon after Rehensh is called into action for the for the first time. 19' Das with a ball in, Rafique lurking but comfortable catch for the keeper. 18' Borges drives forward again, passes to Nikhul who once again gives the ball away. 16' Weedson with a shot from distance comfortavble for the keeper. 14' Borges gets the ball in the box elects not to shoot and passes but the move fizzles out. 10' Gurwinder gives a foul down the left and Rane sends in his freekick but Anwar rises the highest to clear! 7' Aizawl try to break after East Bengal pass the ball around the Aizawl box but Kima loses the ball to Wedson who has again come behind to help out his team. The teams are looking rusty as expected. 5' Jackichand tries an early cross which goes wide. 4' East Bengal already on the attack in the early going..
1' We have lkickoff here in Kolkata just listen to the noise. 04:35: The Teams are out and a great atmosphere greets us in this season opener. We are almost ready. 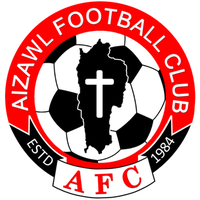 04:25pm The Red and Hold seek a maiden I-League crown while Aizawl are now under the stewardship of Khalid Jamil. 04:20pm We are less than 10 minutes away from kickoff in the first game of the season stay tuned. 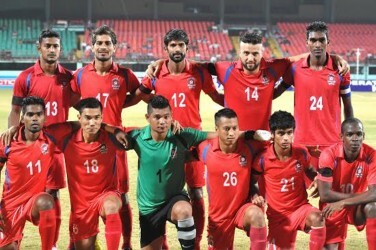 Subs:- Tluanga, L. Tlau, Lalrindika Ralte, Mawia (GK), Lalthakima, Vanlalremdika, Mehta. 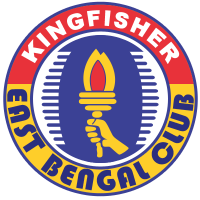 04: 15pm East Bengal: Rehenesh, Bheke, Rafique, Wedson, Jackichand, Borges, Mehtab, Gurwinder, Das, Poojary, Ali. Subs:-Subhasish, Gurung, Bukenya, Plaza, David, Romeo, Ruidas. 04:10 : The team arere in.